In March of 2017 we teamed up to win 3rd place in the Distributed Markets Blockchain Hackathon! The inspiration for this hackathon project came to us from an interview with a Central American coffee grower who complained that FairTrade coffee movement was not working for him, and only benefited the middle men. With blockchain technology, it is possible to level the playing field between farmers, the supply chain ecosystem, and even enable the consumer to invest in the future of his or her favorite products! By using blockchain technology we created a proof of concept decentralized supply chain for coffee allowing for complete transparency into the movement of coffee beans from grower all the way to consumer, and then created an opportunity for the consumer to directly invest in the future crops of the coffee grower. Our proof of concept was built on top of the Linux Foundations Hyperledger Fabric blockchain implementation. We created an SMS interface that allowed the farmer to enter his beans into the supply chain blockchain, and receive alerts as his beans moved through the supply chain. 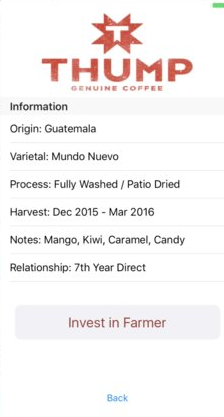 We also created an iOS app, that allowed the consumer to scan a QR code on a cup of coffee, and find out the origin of the beans and also make an investment in the future crops.